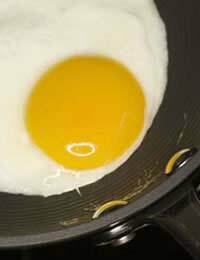 It is a good idea to keep half a dozen eggs in the house so you can always whip up a quick, tasty and nutritious meal. All too often people overlook the humble egg as a source of protein in their diets, perhaps thinking they are too high in cholesterol to eat regularly. But studies have shown that an egg a day does no harm to your cholesterol levels and is a low fat, low cost source of protein – excellent for weight management. Cooking with eggs is also quick and simple – the best egg dishes do not take long to cook and take very few other ingredients to make a great meal or snack. Here are a few ideas to get some more eggs into your weekly menu. Toast four pieces of bread on one side under the grill (this is enough for two people, although you may prefer to make a couple more pieces, just in case!). While you’re doing this, beat two fresh eggs in a jug or bowl and add lots of grated strong cheddar, to make a thick paste, you don’t want to see any liquid from the eggs, just glossy, eggy cheese. Turn the toast over and pile the cheesy mix on top of the untoasted side. Sprinkle on some Worcestershire sauce, too, if you like it. Then grill this side under puffed up and golden. Delicious! More of a classy starter or light lunch than a salad, really. Lightly boil or steam some fresh asparagus – about eight to ten stems per person. Lay the asparagus spears on a warmed plate (have them all facing the same way, it just looks better) and shave over lots of parmesan. Sprinkle over some olive oil and balsamic vinegar. Top with a perfectly poached egg (or two for bigger appetites) and grind over plenty of sea salt and black pepper. Perfect with some warm French bread and good butter. Crepes are a wonderful standby – a decadent breakfast, quick lunch or stylish dessert. Mix a cup full of plain flour with a pinch of salt, two eggs and a cup of milk. Make sure there are no lumps or when you are cooking the crepe you will see lumps of flour. Use a whisk, rather than a fork. Let the batter stand for a little while and remix just before you want to cook. Put a heavy based frying pan onto the heat and add a knob of butter. When the butter is just foaming, pour in some of your batter and swirl it round to cover the base of the pan. Leave it for one minute (no fiddling with it!) and then turn it over by using a fish slice. As soon as you have turned it over, add in your filling – lemon and sugar always works, but try garlic mushroom and gruyere or orange juice and maple syrup. Lovely!